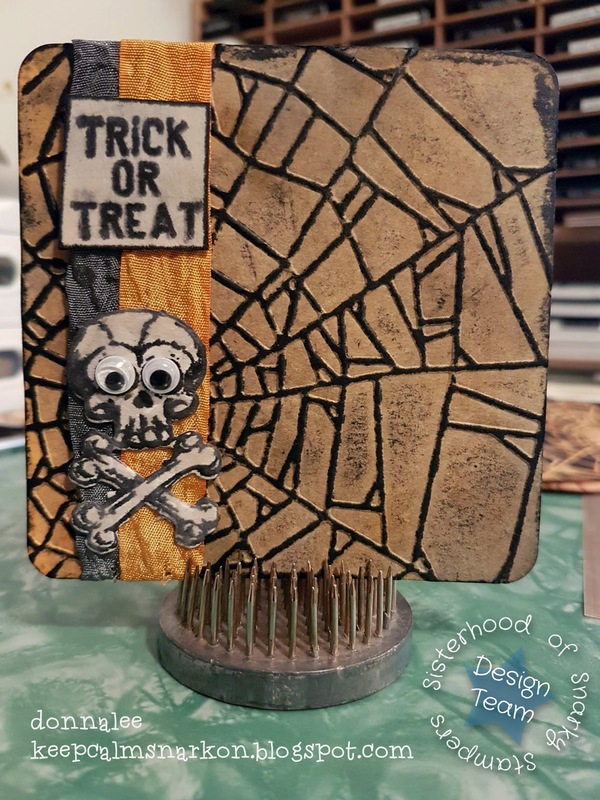 Thanks for stopping by to check out the latest challenge from Edna and the sisterhood of snarky stampers! I recently picked up a new Tim Holtz Halloween set that had stamps, dies and an embossing folder, so of course I used them ALL on my Halloween coaster. This was a super fun inky mess to make, between inking and spritzing the background to dying the ribbon to match, it's a good thing it's the weekend and I don't have to go to work with orange and black fingers! As always, Edna would love you to play along and join the sisterhood. While you are there, please share some crafty love and comments with our reigning queen of snark and the rest of the sisterhood! Brilliant - I love that cobweb, in fact I'm going to head off and add the embossing folder to my wants list. WOW this is awesome, I love the embossed background and added googly eyes, so fun! This is so freaking AWESOME!!! Love everything about it! WOW! 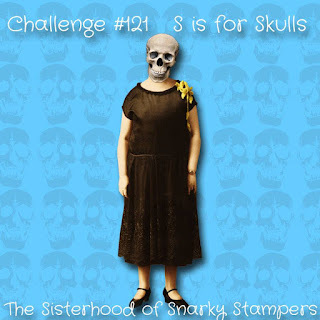 So technique-y and skull-y and awesome!